This is an adventure slot game for anyone out there with a penchant for Victorian-era dragon slaying. Embark on a journey through time back to 19th century England and meet the Lord of the Steamtower and defeat the dragon that lurks beneath. This 5 reel online slot game is filled with hardened steam workers, fire-breathing dragons and a whole load of free spin bonuses. NetEnt’s strong, corporate culture allows their growth to mirror that of the online casino industry. With rapid growth, comes relentless change, and they continue to deliver innovative gaming solutions to match the needs of their customers – based on research that comes directly from the fingertips of we, entertainment hungry gamers. NetEnt are a proven industry identity, who can be found at more than 170 online casinos worldwide. The latest in NetEnt’s ventures into the vast realms of history, Steam Tower, takes us into the vivid world of Steampunk – a thriving contemporary art form and modern subculture based on the Victorian industrial era. 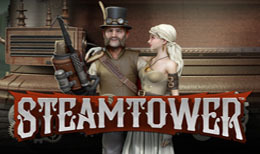 We play as the bold hero – 16 floors of tailored overalls and exciting chance from rescuing his bohemian princess from a fearsome dragon at the top of Steam Tower in this online slot game. Graphically, this game incorporates all the elements you’d expect to see from a steampunk catwalk show or exhibition. Worn leather, complex, ingenious dials and cogs, and steel - piping hot from relentless bursts of steam - make up the visuals, while the audio also hums with the mechanical rhythm of the perceived era. As you’d expect from a tower with 16 stories, the steadily incrementing multiplier is an increasingly satisfying aspect of the game, from the moment we find ourselves on the ground floor of this 5 reel, 3 row, 15 win line slot. We start by setting our level of bet – with the value of our coin ranging from £0.01 to £1.00, and a one coin minimum – or set up our coin value and select a rapid autoplay, to set the steam to its most persistent hiss! The regular J, Q, K and A are the lower value symbols here, while the tower itself, our princess, our hero, and the glaring eye of the dragon that awaits us the higher value symbols we encounter. Along with the hero, the grappling gun here is the Wild, and with the hero stacked on the reels our progress up the tower – aided by the regular stream of Free Spins – is swift, once it begins. The moment the grappling guns starts appearing on our screens, those 16 floors suddenly don’t seem very far to climb, with a potential 1000 x the stake - and a multiplier of x7 thrown in to boot – waiting for us at the top! The high level of payout in this game is particularly appealing, with wins coming as regularly as you’d expect from an atmosphere comprised of quality, clockwork machinery. The incentive to save a princess from a dragon adds an extra layer of narrative to the story, and its fantastical elements are certainly matched by its overall quality. NextGen have created another involving, original online slot with Steam Tower. The combination of history and fantasy, of subculture and style, makes the game an excellent addition to their relentless catalogue of quality titles. At Dream Jackpot we found the pace of the game delightful, with 16 floors of entertainment acting simultaneously as a challenge, and a regularly achieved accomplishment. Steam Tower is a 10/10 title. Another game is waiting for you, Try your luck and play Stickers.